It's GIVEAWAY TIME and just in time for Valentine's Day! 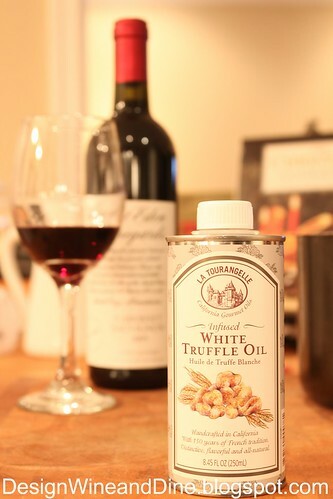 Here's your chance to win a beautiful tin of the LA TOURANGELLE WHITE TRUFFLE OIL I've been talking up for weeks! Meant to enhance the flavor of your already fabulous dishes...I've drizzled LA TOURANGELLE WHITE TRUFFLE OIL atop a Creamy Mushroom Risotto, Roasted Brussels Sprouts, Mashed Potatoes and Filet Mignon! How wonderful would it be to give your Valentine's Dinner ...that extra special touch! So basically, you're leaving one comment, two comments OR three comments below...each granting you a number (or numbers) that if drawn at random... will make YOU THE WINNER! I will do a random drawing on Friday, January 28th, announce the winner via my blog and get the White Truffle Oil to you in time for Valentine's Day dinner! GOOD LUCK! I love truffle oil... and I follow your blog! I love truffle oil... and I'm a fan on FB!! Wee ha I love a giveaway :) Never tried truffle oil and would LOVE to! And I like you on facebook, too! Oh goodness, what a great giveaway!! Love the Blog...glad I found it through Chow and Chatter! Just "loved" ya on Facebook! I love truffle oil but I've never had this brand. Love the tin! I am already a follower. I know I'm your sister but can I still enter? Its not like you are exactly sharing this stuff with me anyway.....I totally do follow your blog, f'real. OH and I've been following your blog for sometime now. Great inspiration! And...I just followed you on FB! lol Go me!!! I can't tell you if I love this I havent never tried it but would love to! OMG..... I would love this! This would be a savory Valentine's day gift. I'm following you via Google Reader and Twitter. This sounds divine on risotto, I am perusing your recipes & loving what I see! I have been inspired many times to use White Truffle Oil myself but have yet to be lucky enough to get my hands on some. (crossing fingers!) Of course, a great idea for V-day (or lucky me, anniversary in 2 weeks!) Thanks for putting on the giveaway! P.S. I follow you on Twitter too! Great giveaway! I've never used truffle oil but would love to try it! I'm a follower of your great blog! I didn't realize that I wasn't a follower yet....now I am!! This is a beautiful giveaway! This stuff sounds so good I mike also use it to soak in with bubble bath. I've never cooked with truffle oil before, but I love the opportunities it presents :) Awesome giveaway! wow fancy schmancy oil! i would love to try it! I would love to win the truffle oil! Over the weekend I had a Wild Mushroom Risotto with Truffle Oil drizzled on top. It was delicious! I would love to win the oil so I could recreate it. I just "Liked" your facebook page. Oh what a wonderful giveaway. I became your follower, joined your facebook page and shared your link on facebook. I will also post about your giveaway on my blog. Please enter my giveaway if you would like. Great giveaway! I've really wanted to try using this!!! I LOVE to win truffle oil! Thanks a million, what a great giveaway! Oh what a very yummy giveaway! ;) Keeping my fingers and toes crossed to win! I've been dying to try truffle oil and would love to win! Just found your blog - Im a new follower! I hope it's not too late for free truffle oil. I'll bet this would be heavenly on mushroom risoto. I was your 58th liker on Facebook. I am your 72nd blog follower. I now follow your beautiful blog, "Liked" you on Facebook, tweeted about the giveaway! Looking forward to trying the almonds! I would love truffle oil! Very nice article. I will wait next one.